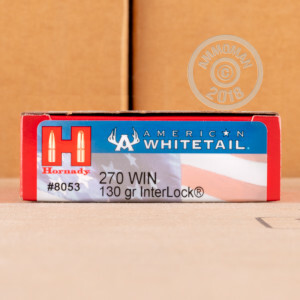 Bring down that trophy buck with this .270 Winchester ammunition from Hornady's American Whitetail series. 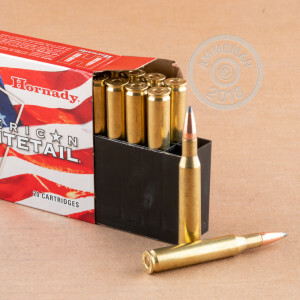 These US-made cartridges come in boxes of 20 and fire a 130 grain Interlock soft point bullet at a muzzle velocity of 3,060 feet per second and deliver superb performance even at extended ranges. The Interlock bullet features an aerodynamic profile with a wind resistant boat tail and a locking ring to keep the jacket and core intact. Upon contact with the target, the lead core expands following pre-cut lines in the jacket, producing just the right amount of penetration and mushrooming needed to bring a deer down quickly. 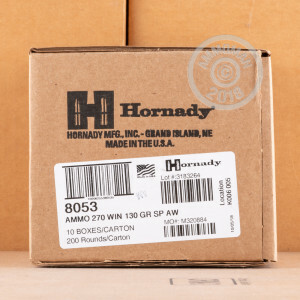 Hornady ammunition is loaded in Grand Island, Nebraska using non-corrosive Boxer primers and brass cases. Have not fire this ammo yet, living in California so stocking up is more important than shooting.